Objectives The Patient Evaluation of Emotional Comfort Experienced (PEECE) is a 12-item questionnaire which measures the mental well-being state of emotional comfort in patients. The instrument was developed using previous qualitative work and published literature. Setting Acute Care Public Hospital, Western Australia. Participants Sample of 374 patients. Interventions A multidisciplinary expert panel assessed the face and content validity of the instrument and following a pilot study, the psychometric properties of the instrument were explored. Main outcome measures Exploratory and confirmatory factor analysis assessed the underlying dimensions of the PEECE instrument; Cronbach's α was used to determine the reliability; κ was used for test–retest reliability of the ordinal items. Results 2 factors were identified in the instrument and named ‘positive emotions’ and ‘perceived meaning’. A greater proportion of male patients were found to report positive emotions compared with female patients. The instrument was found to be feasible, reliable and valid for use with inpatients and outpatients. Conclusions PEECE was found to be a feasible instrument for use with inpatient and outpatients, being easily understood and completed. Further psychometric testing is recommended. This is the first publication of a new research instrument to measure the mental well-being state of emotional comfort. This instrument will contribute to the awareness, understanding and measurement of patient experience and outcomes. It will assist with development and increased use of psychosocial interventions and may be used to identify patients in additional need of psychosocial care. This work represents a change in focus for evaluating positive rather than negative health outcomes and advocates greater use of a biopsychosocial healthcare model. The reliability and validity of the instrument are limited to the results of this study. Further psychometric testing in different populations and settings is recommended. The Patient Evaluation of Emotional Comfort Experienced (PEECE) is a 12-item questionnaire which measures the mental well-being state of emotional comfort. This paper describes the development and testing of this new research instrument which is intended for use with inpatients and outpatients within the acute care hospital setting. It has been suggested that a paradigm shift in healthcare is required which recognises and incorporates patient views and perspectives,20 although more research is required to further determine the relationship of these factors to patient outcomes.15 The PEECE instrument measures the patient experience outcome of emotional comfort and it is suggested that this instrument may be used to explore the effect of various psychosocial interventions in different healthcare populations. In previous qualitative research by the first author (AMW), a substantive theory about the psychosocial experience of the patient was developed.14 ,26 ‘Emotional comfort’ was identified in that theory as a therapeutic state which assisted patients to be proactive in their recovery. Emotional comfort can be viewed as an outcome of patient experience and refers to a perceived personal psychological status. Emotional comfort is defined as pleasant positive feelings, a state of relaxation, an optimistic approach to life, where a person feels happy and their mood is high in spirits. Emotional comfort is associated with less physical discomfort. 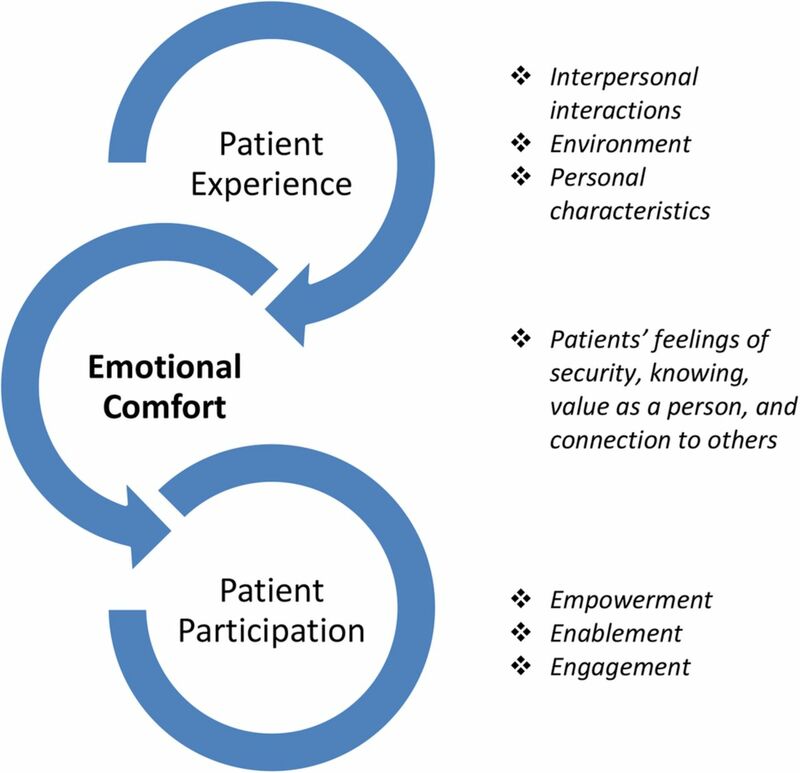 Emotional comfort in relation to patient experience and participation. In 2008, an instrument (questionnaire) was developed by the first author, using data from the original study. This instrument measured the emotional care experienced by patients in hospital through interpersonal interaction with staff. The reliability and validity of the ‘Patient Evaluation of Emotional Care experienced during Hospitalisation’ (PEECH) was established.29 ,30 The PEECH was further developed by Murrells et al,31 used in combination with the Picker Patient Experience Questionnaire to measure relational aspects of hospital care in England. Further work on the concept of emotional comfort was undertaken through a qualitative study of 16 patients attending a cancer support centre offering complementary therapies in a hospital setting.7 Perspectives of therapeutic and non-therapeutic experiences of integrative therapy of patients with cancer were explored. The findings indicated that the personal control of participants was increased by their attendance at the cancer support centre and this helped to facilitate feelings of emotional comfort. When patients felt emotionally comfortable, they were found to be more actively involved in the treatment of their illness. The centre was described as an ‘Oasis’ in the hospital, a special place where patients felt safe, valued and cared for as a whole person. The centre also provided a sense of community, a place where people could connect, especially patients who were living away from home. The use of complementary therapies were highly valued and said to evoke feelings of relaxation and calm. Through this work, it was recognised that there could also be value in the measurement of emotional comfort itself, to capture the influence of other factors apart from interpersonal interactions, and hence the work described in this paper. The state of emotional comfort could be considered as a state of subjective psychological well-being. Several instruments have been developed to measure these concepts such as the ‘the Psychological General Well-being Index’,32 the ‘Scales of Psychological Well-being’33 and ‘the Everyday Feeling Questionnaire’.34 Although these instruments have merit, none are specifically designed for use in patient populations. An instrument, developed through an in-depth analysis of the positive state of comfort, from the perspective of ill persons, is more likely to be sensitive to any changes which result from psychosocial interventions implemented by healthcare providers. Development of an instrument with an ill population will ensure ease of completion by patients and administration by healthcare providers. Only two previous instruments measuring the comfort of patients have previously been developed, the General Comfort Questionnaire35 and the Radiation Therapy Comfort Questionnaire.25 However, these instruments differ from PEECE as they measure holistic comfort and include physical, psychospiritual, social and environmental dimensions. To determine if emotional comfort is a uniquely identifiable concept that can be measured. To establish whether the new instrument demonstrates face and content validity. To explore the feasibility of the instrument by examining whether it is clear and easily understood by patients. To determine whether the instrument demonstrates internal consistency reliability. In step 1, PEECE was constructed using the raw data and analysis from the previous qualitative work on emotional comfort.26 Relevant published literature and previously published instruments were also reviewed and used in the construction of the instrument. The study received ethical approval from the Human Research Ethics Committee at a public hospital and University in Perth, Western Australia. Informed consent was obtained from all individual participants included in this study. In step 2, an expert panel of eight persons was convened to assess the face and content validity of the PEECE instrument. This panel was multidisciplinary and consisted of representatives from relevant areas of nursing, medicine and clinical psychology. The panel included both clinicians and researchers. The initial instrument consisted of 15 questions relating to emotional comfort and 7 demographic items. Each panel member was provided with the original publication which defined emotional comfort14 and asked to read this prior to reviewing the instrument. Panel members were asked to state ‘yes’ or ‘no’ to the individual emotional comfort questions in terms of the following: ‘wording is clear’, ‘fits with emotional comfort’, ‘measures emotional comfort’ and ‘question is needed’. A space for comments for each question was provided and members were also asked to review the demographic questions. In step 3, the PEECE instrument was pilot tested using a sample of 57 outpatients. These patients were identified through a cancer support centre, as well as a haematology and cardiac rehabilitation clinic at a public hospital located in Perth, Western Australia. Patients were eligible to participate if they were aged over 18 years, able to communicate in English and consented to participate. The instrument was administered by a research assistant and feedback regarding the understanding of the phrasing of the questions and the ability of patients to answer was also explored. Data collection took place in 2013–2014. The European Organisation for Research and Treatment of Cancer feedback form36 was used as a further evaluation of the PEECE instrument for length, clarity and presence of distressing questions. Patients completed the form after completing the PEECE instrument. They were asked to identify which questions, if any, they found difficult to answer, and if any of the questions had concerned or upset them. Space was provided for comments in addition to the questions about the instrument. A sample of 317 patients was recruited in the main study during 2014 at the same acute care hospital as the pilot study. The selection criteria were the same as in step 3, but the population consisted mainly of inpatients (excluding the emergency department and the intensive care unit) along with some outpatients. The clinical nurse specialist for each clinical area was contacted by the research assistant and asked to identify potential participants who were deemed well enough to participate. Patients were approached and informed of the study. If the patient was willing to participate, a consent form was signed. An exploratory factor analysis (using SPSS V.22) using principal axis factor analysis was first used to determine the underlying dimensions of the PEECE instrument. A confirmatory factor analysis (using Mplus V.6.0) was then used to test the goodness of fit of the hypothesised factors structures. For the pilot study, a separate factor analysis was performed on each of the subscales to verify the internal structure of the PEECE using principal components with varimax rotation. Cronbach's α was used to determine the reliability. Participants in the main study were given an identical second questionnaire to complete 7 days following completion of the first questionnaire, together with a reply paid envelope. This was done to examine the stability of the PEECE instrument over time and within the hospital setting (test–retest). Two hundred and three participants returned this questionnaire. The κ was used for test–retest reliability of the ordinal items. Written comments from participants on the questionnaires were transferred to a word document and coded using the qualitative data management program NVivo (QSR International, V.10, 2014). Content analysis was performed using these data. Following construction of a 15-item instrument, the face and content validity was assessed using a multidisciplinary expert panel. The responses from this panel were collated and the instrument was adjusted and reduced to 12 questions relating to emotional comfort. No changes to the demographic questions were indicated. The instrument was named PEECE. Fifty-seven patients participated in the pilot study using the new instrument. The average age of the patients in the sample was 60.6 (SD 10.5) with 54% male and 46% female. The majority of patients were born in Australia (61%), 14% from the UK, 11% from New Zealand and the remaining 14% from a wide range of backgrounds. Over one-third of patients had been hospitalised once in the past year (36%), 23% were hospitalised twice in the past year, 25% hospitalised at least three times in the past year and 16% were not hospitalised in the past year. Health conditions included diagnosis of either cancer (58%) or a cardiac problem (42%). The majority of patients took <10 min to complete the questionnaire (61%), while 19% took 11–15 min, 14% took 16–20 min, 4% took 21–30 min and 2% took over 30 min. Overall, 25% (n=13) of patients had help completing the questionnaire. Help was given by a family member (n=4), friend (n=1), community nurse (n=1) and research assistant (n=7). Help included verbal support (n=3), making sure questions were understood (n=4), filling out the form (n=1), and dates and spelling (n=1). Following a thorough review of the pilot results, it was decided that no changes to the instrument were indicated. The data from the pilot study were therefore included in the analysis for the main study. PEECE consists of 12 items, all of which start with the same statement “I feel…relaxed, valued, safe, calm, cared for, at ease, like smiling, energised, content, in control, informed, thankful”. Participants were asked to score how they were feeling emotionally ‘right now’ and to tick a box corresponding to five possible responses from ‘not at all’, ‘very little’, ‘somewhat’, ‘very’ and ‘extremely’ for each of the 12 items. The scores were converted into numbers from 0 (not at all) to 4 (extremely). An exploratory factor analysis using principal axis factor analysis was used first to determine underlying themes within the data. Final estimates of communalities were iterated from squared multiple item correlations to convergence. The item pool was deemed suitable for factor analysis (Kaiser-Meyer-Olkin (KMO)=0.78). Using Kaiser's criterion (Eigenvalues≥1.0) together with Cattell's scree test, three factors were extracted accounting for 67% of the common variance in the questionnaire data. A confirmatory factor analysis was then used and overall adequate fit was obtained where both the Comparative Fit Index (CFI) and the Tucker-Lewis Index (TLI) were >0.9 (CFI≥0.9, TLI≥0.9)37 with excellent scale reliability (ie, how accurate and precise is the instrument; all α>0.7; table 1). Factor loadings ranged from 0.49 to 0.85. Cronbach's α was used to determine the reliability of the three factors. All factors had high significant reliability with Cronbach's α coefficient ranging from 0.74 to 0.88. The total sample for the main study was 374 which included data from the 57 participants in the pilot study, as no changes to the instrument were required. The average age of patients in the sample was 60.7 (SD 16.3) with 49.5% (n=185) of male patients and 50.5% (n=189) of female patients. The majority of patients were born in Australia (61%) with a further 19% from the UK and 4% from New Zealand, while the remaining 16% were from a range of backgrounds. Over one-third of patients had been hospitalised once in the past year (37%), 23% were hospitalised twice in the past year, 15% were hospitalised three times in the past year, and 4% were not hospitalised in the past year. The rest of the sample (21%) were hospitalised four or more times. Health conditions included cancer (23%), gastrointestinal (18%), respiratory (16%), haematological cancer (10%), cardiac (7%), renal (7%), orthopaedic (4%), complications from treatment (3%), endocrinology (1.3%), dermatology (1.3%), neurology (1.6%), other (7.2%) and more than one health problem (2%). The majority of patients recruited for the main study were inpatients (83%). The analysis for the main study followed the same methodology as for the pilot study using an exploratory factor analysis using principal axis factor analysis, followed by a principal component analysis. Two factors were extracted using an exploratory factor analysis accounting for 58% of the common variance factor. A confirmatory factor analysis was then used to test the goodness of fit of the two factor structures. An overall adequate fit was obtained where both the CFI and the TLI were >0.9. Factor loadings ranged from 0.63 to 0.86. Loadings of 0.50 and over are considered ‘practically significant’.38 The PEECE instrument was found to contain two subscales. Factor 1 was named ‘positive emotions’ and factor 2 ‘perceived meaning’ (see table 2 for factor loadings). Sixty-nine per cent (n=258) of patients fell into the high level of positive emotions and 31% (n=116) of patients fell into the low level of positive emotions. The χ2 analysis was used to determine if there were any significant dependencies between demographic variables and positive emotions. There were no significant differences between the levels of positive emotions with respect to age, country of birth, main health condition or the number of times hospitalised in the past year (all p>0.05). There were, however, significant differences with respect to gender with a significantly greater proportion of men (74%) in the high level of positive emotions compared with women (64%; p<0.05). Binary logistic regressions were used to calculate ORs. Men were 1.6 times more likely to have high levels of positive emotions than women (OR=1.60, 95% CI 1.03 to 2.50; table 3). Ninety-four per cent (n=353) of patients fell into the high level of perceived meaning category and 6% (n=21) of patients fell into the low level of perceived meaning. The χ2 analysis was used to determine if there were any significant dependencies between demographic variables and perceived meaning. There were no significant differences with respect to the levels of perceived meaning and gender and country of birth (all p>0.05; table 3). Owing to the large proportions of people in high levels of perceived meaning, χ2 statistics could not be calculated for age, main health condition or the number of times hospitalised in a year. Using the Kolmogorov-Smirnov test, all scale items were significantly different from normal (all p>0.05; table 2). However, when examining the skewness and kurtosis of items, all items except ‘thankful’ fell within the range of −2 to +2 and are considered to be normally distributed.39 Cronbach's α was used to determine the reliability of the two subscales. Scale reliability was found to be excellent (positive emotions α=0.80, perceived meaning α=0.87). Carmines and Zeller40 suggested that at least 50% of item-to-total correlations should be between 0.40 and 0.70. Scores above 0.70 could suggest redundancy of items while scores below 0.40 indicate that the item may not contribute information. All items showed high discrimination (corrected item-to-total correlation >0.20). While all item-to-total correlations were within the 0.40–0.70 bounds for perceived meaning (0.40 to 0.67), 86% of positive emotions item-to-total correlations (0.56 to 0.73) were within the bounds, which is higher than the suggested 50%. Since removing any of the items from the subscales would decrease Cronbach's α, all items were kept in the subscales. Data were analysed from 203 participants who had completed two questionnaires on separate occasions, to examine the stability of the PEECE instrument over time. The κ has been used for test–retest reliability of the ordinal items (table 4). All items showed significant test–retest agreement (all p<0.05). Comments from participants written on the questionnaires were coded into six main categories: staff influences, provision of service, current level of health or illness, hospital food, communication and emotional well-being. Staff influences related to the care received from all staff in the hospital. Most of the comments were very positive and included terms such as ‘outstanding’, ‘brilliant’, ‘supportive’, ‘friendly’, ‘helpful’, ‘diligent’, ‘attentive’ and ‘top class’. Nurses were described specifically as ‘caring’, ‘compassionate’, ‘dedicated’ and ‘exceptional’; medical staff were described as ‘lifesavers’. Comments about provision of service were mixed with some patients feeling frustrated about delays in treatment, diagnostic mistakes, inadequate nurse staffing numbers and communication issues. Current level of health or illness related to perceived control over circumstances and coping with treatment outcomes. For example, pre-existing anxiety or depression, the experience of stoma surgery, or receiving chemotherapy restricted their ability to carry out regular daily activities. Some patients found the hospital food ‘excellent’, while others felt that the food was ‘substandard’. Communication comments also varied with some patients feeling that they had all their questions answered, and others either not understanding the information they were given, or feeling that they had not being given enough information. In the emotional well-being category, participants described being stressed and needing more emotional support. Anger about not having enough control over their condition was also expressed. Some patients felt that the hospital environment was depressing and uncomfortable when they had to share rooms with other sick or confused patients. Others felt that they had a positive outlook or state of mind, regardless of their circumstance, and that they were well supported by staff and family. The PEECE research instrument was developed using previous qualitative work on the emotional comfort of hospitalised patients together with relevant published literature. The psychometric properties of this instrument were explored in a sample of 374 patients experiencing various health problems. Emotional comfort was found to be a uniquely identifiable concept that could be measured, with face and content validity of the instrument established using an expert panel. The clarity and feasibility of the instrument was assessed by 57 patients in the pilot study. It was easily understood and completed in a short period of time. Highly significant internal consistency reliability was demonstrated with Cronbach's α coefficient ranging from 0.74 to 0.88. Two factors were identified in the instrument and named positive emotions and perceived meaning. The characteristics of these factors are similar to those used in positive psychology, namely ‘positive emotion’ and ‘meaning’ described by Seligman41 in his book ‘Flourish’ (p.16–17). Seligman views these as elements of well-being and he also identifies ‘engagement’ and ‘accomplishment’ and ‘positive relationships’. Fredrickson and Joiner's42 ‘Broaden and build theory of positive emotions’ highlights the potential long-term psychological benefits of positive emotions. The similarities between emotional comfort and well-being may assist in greater use of positive psychology principles in healthcare. Until now, the use of positive psychology has been limited and yet there is great potential for its application, particularly in the area of rehabilitation.43 PEECE provides a measure by which the effect of positive psychology interventions in patient populations could be evaluated. Our understanding of what contributes to well-being and perceptions of happiness have increased in recent years and the health benefits have been researched. A meta-analysis of 150 studies found evidence to suggest that there is a relationship between physical well-being and positive health status.44 Likewise, a relationship between mental well-being and positive thoughts has also been identified.45 Measurement of these aspects of well-being using the PEECE instrument may prove to be valuable indicators of future healthcare needs and outcomes. Patients in this study described a number of aspects of the hospital environment which impacted on their emotional comfort. A greater awareness, understanding and measurement of the effect of factors in the environment on the well-being of the patient will ultimately lead to improvements in patient experiences and outcomes. In conclusion, this study describes the first use of a new research instrument measuring the emotional comfort of patients. The PEECE instrument was found to be a feasible instrument for use with inpatient and outpatients, being easily understood and completed. This instrument represents a change in focus for evaluating positive rather than negative health outcomes. It is predicted that an assessment of patients' feelings of emotional comfort is more likely to indicate whether interventions of a psychosocial nature are of value. It is anticipated that PEECE may be useful in clinical practice as a means by which vulnerable patients may be identified. PEECE provides a standard measure by which patients could be monitored and interventions adjusted accordingly. It has particular application for inpatients and outpatients, patients with chronic illness or long-term rehabilitation. There may also be application for this instrument in other areas such as mental health. Evidence of face and content validity was demonstrated as well as internal consistency reliability. The reliability and validity of the instrument are limited to the results of this study. Subsequent work on this instrument could explore the concurrent validity. Combination with other instruments which address similar concepts would also be useful, such as the Patient Activation Measure,50 the Partners in Health Scale,51 the Patient Enablement Instrument,52 the Patient Health Engagement Scale16 and the Altarum Consumer Engagement Measure.53 Further psychometric testing in different populations and settings is recommended. Catherine Pienaar is acknowledged for the coordination and assistance with the pilot study and Dr Toni Musiello for contribution to the initial design and instrument development. The authors would also like to thank the following people for their assistance in the recruitment of patients for this study: David Jennings, Kylie McCullough, Gemma Evans, Claire Murphy-Marshall, Anne Matthews and Grace Chen.
. What really matters? A multi-view perspective of one patient's hospital experience. Contemp Nurse 2014;49:122–36.
. Patient perspectives on quality. Qual Prim Care 2014;22:11–15.
. The contribution of therapeutic interpersonal interactions to the comfort of hospitalised patients: a grounded theory study of the patient's perspective. Curtin University of Technology, 2003.
. The psychological well-being (PGWB) index. In: Wenger NK, Mattson ME, Furberg CD, Elinson J, eds. Assessment of quality of life in clinical trials of cardiovascular therapies. Le Jacq Publishing, 1984:170–84.
. Guidelines for developing questionnaire modules. 4th edn. EORTC Quality of Life Group, 2011.
. Multivariate data analysis. 7th edn. New York: Pearson, 2010.
. SPSS for Windows Step by Step: a simple guide and reference, 17.0 update. 10th edn. Boston: Pearson, 2010.
. Flourish: a visionary new understanding of happiness and wellbeing. Atria Books, 2011.
. Of passions and positive spontaneous thoughts. Cogn Ther Res 2016. [Epub ahead of print]. Contributors All authors named on this paper have contributed significantly and are in agreement with the content of this manuscript. AMW, LL, CB, AP, KB, DJ were involved in conception of work. EA, AMW, AP were involved in data collection. LL, AMW, KB, EA were involved in data analysis and interpretation. AMW, LL, CB, AP, KB, EA were involved in drafting the article. AMW, LL, CB, AP, KB, EA, DJ were involved in critical revision. Funding SolarisCare Foundation grant. Proposal number G1000457; administered by Edith Cowan University. Ethics approval Sir Charles Gairdner Hospital and Edith Cowan University.